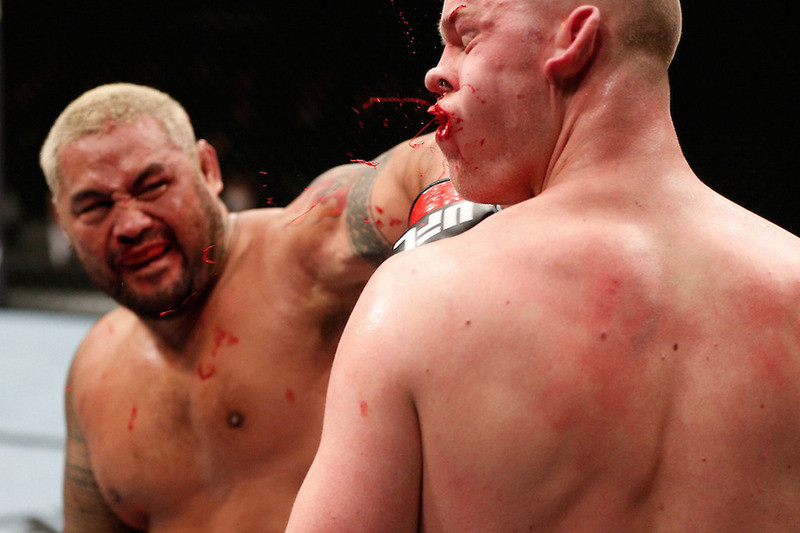 Mark Hunt knocked out Stefan Struve at 1:44 in the third round of yesterday's UFC event in Japan, but he didn't just knock him out. The left hook knocked out a tooth, and as Struve would later discover, broke his jaw. Just before the ending sequence, the guys were a little bit more than 15-feet away from me when Hunt threw a big right hand that landed flush. I had a bad angle for it, Hunt was completely hidden and all I saw was Struve's back, so I didn't fire my camera. But looking through the eye-piece, I noticed this look on Hunt's face as Struve absorbed the shot without going down. If I could put it into words what his face said, it would be "What the hell do I have to do to beat this kid?" At that point, I told myself to get ready. I had that feeling he was going to throw another right with even more power than the previous shot. I was right. Hunt blasted Struve with a massive right hand, followed by a ridiculous left hook. My angle was still not favorable for the first sequence, but I managed to capture it nicely still. I caught these in two 3-shot bursts. For the first sequence of the right hand, I had my focus point over to the right side of the viewfinder up a little from center, dead on Hunt's face as he launched the punch. I did my best to keep tracking him with the AF point, but to be honest, I'm surprised any of the shots after the first were sharp. For the second sequence of the left hook, you can see the second frame is not as sharp. The action was so fast, I couldn't switch the AF point and remained on the right side. So then Struve jumped into focus. Hedges includes the two three-shot sequences, but here's the one immediately after. The jaw is broken, the blood is flying, and Struve's brain is just starting to get the message that the body's going down.